Small ceramic jug that was probably created as a souvenir by the McCormick Distillery of Weston, Missouri. Paper label advertises "BOTTOMS UP! 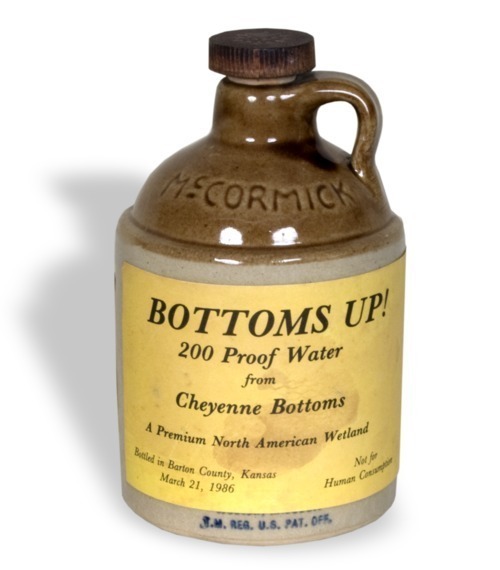 / 200 Proof Water / from / Cheyenne Bottoms." It was used in a 1986 campaign calling attention to the endangered Cheyenne Bottoms wetlands, located northeast of Great Bend in Barton County, Kansas.